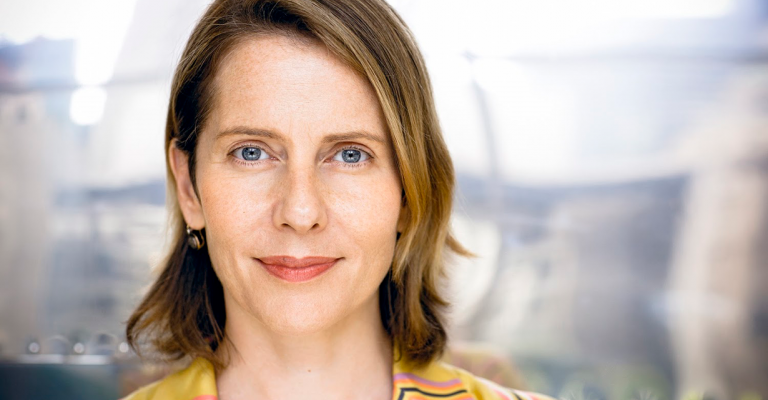 Paola Antonelli has been senior curator of art and design at the MoMA since 1994. In that time, she has seen the revolution design has gone through and and has presented it through some of the most dynamic exhibitions in the world. Born in Sardinia and raised in Milan, Antonelli was raised by two doctors and was headed down the path economics when she realized that wasn’t what she was meant to do and decided to study architecture at the Polytechnic Institute in Milan. Her mentor at the school was equally interested in philosophy and she believes music taught her the English language. After graduating, she began teaching UCLA and found an ad for the curator position at MoMA. She applied and she got it. Over the past decades, Antonelli has mounted some of the museums most captivating shows, including the infamous Design and the Elastic Mind. In this interview, we speak about her mentors, our default fonts and the acquisition of the at symbol. We spoke in her office at the MoMA overlooking a bustling NYC. Objects are hooks for me, and that’s how I go through life. Everything is a door that opens into either my personal memory or into a daydream of where the object was designed, and who did the molding, and the kind of the injection molding, and just go into this whole daydream. That’s why I like to share with people, and that’s why I became a curator, but I see immediately that people connect with things. There’s no distance. There’s no high and low anymore. You don’t have to come to the museum to take your vitamins of high art. You can just come to recognize yourself in the objects that are on the shelves, which is the best. I’d be curious to know what was an object from your childhood? An object from my childhood? Well, the Slinky for instance. I remember when my father brought a Slinky home, but there are so many objects that are in this museum that were a part of my childhood. There is, we used to call it Mangiadischi, which means record eater. It’s one of those gramophones by Mario Bellini, the orange one that you put the record in the mouth. I grew up with that. What else did I grow up with? Well, all of the Castiglioni furniture or the Italian or the Joe Columbo, little plastic cart with all the drawers. I still have it in my home, not to mention the bean bag chair, which is, as you can see because you almost tripped on it, I live with bean bags chair. I just like lying down like cows on the floor, so many. It’s not funny. It’s really many. Are there bean bag chairs in your house? Oh, yeah. Absolutely. Only one because I don’t have such a big house, but even in that case my house is not, it is high design. Doesn’t look like a museum at all, but that’s because one uses the high design, right? High design is the one that fits the best in your life. Does he talk about design, because he kind of reneged design to move into architecture? I know, right. He was just the best product designer, but he’s almost abdicated that part of his career. Did he tell you about the projects or about the objects? Only because I asked him about his history. It’s so funny. Anyway, what can you do? I wonder why that is. I wonder why he turned away. It’s interesting because you were saying how you turned away from furniture because you didn’t feel like it advanced enough. Yeah, but that’s different. I’m a curator. I feel that in his case, it was a matter of stature. I think that he perceived architecture to be higher than design. Therefore, he wanted to cancel the words industrial designer from his official title, and always have architect. It might be a size issue. You’re house isn’t filled with design objects? Yes, it is, but not with any kind of pretention. The objects range from an extensible table that I bought at a liquidation sale of the Dorset Hotel before we tore it down on 54th Street. It was $60, $50. I have one of the chairs from Hella Jongerius that so beautiful, because she gave it to me and she’s like my sister. We were born two weeks apart. Oh really, the same year? Yeah, same year. Her birthday was two days ago. Then your birthday is coming up? My birthday was 15 days ago. Thank you very much. I have Arco lamp. I have an Ingo Maurer lamp. I have all these objects because they’re great to live with. It’s not a mausoleum at all. I think that’s what can be so enriching about design. It enriches your simple daily activities. Absolutely. It enriches them or it deprives them, because when it’s bad, it’s really bad. That’s why I consider my job and the job other curators like me a social mission. We’re here to help people sharpen their own critical tools, so that they can recognize bad design when it’s in front of them and reject it, either by not buying it or by protesting. Whatever it takes. It’s about rejected not only environmental irresponsibility, not only high prices, not only bad labor practices, it’s also about rejecting ugliness and laziness. I believe that beauty is a form of respect, and when I say beauty, I mean formal elegance. It can be punk beauty. It doesn’t have to be prettiness. I think that showing effort in the formal aspects of design is a way to show respect towards other human beings. There’s no need to accept sloppily shaped and formed objects, including websites, including ATM screens, and all sorts of design. The feeling that I get when I interact with something that’s beautifully designed, even if it’s as simple as something on my iPhone, is so much better than when I’m working with something that hasn’t really been thought through. Yet you go into people’s houses all the time, and you can see that they’ve just thrown things in there that work, not that give them a sense of beauty and satisfaction. Well, they could do better of the same amount of money. With all other variables being constant, they could do better if they knew that they had the choice. If they knew that’s is in their power to do better. Sometimes, it’s just about lifting the veil, and showing people what the standards are. I have to say that the baselines that have been created by companies right now that are much more design conscious is a boon. Of course, the cliché is to say throughout Apple elevated, and it’s true. Much as I don’t like to praise Apple particularly, especially lately, I have to say what Jobs has done and what the company has done is tremendous when it comes to letting people know that they could have beautifully designed objects, but it’s not only them. It’s also the websites. It’s also the screens of so many apps. There’s much more design consciousness right now, and I love it, because I think that people, in the end, will become much more demanding, which is all we need to be, demanding. Sometimes I’ll be working on a really short edit on a tiny paragraph, but I’ll change the font anyways, just so I can enjoy it more. Oh my god. I find that lighting in the house and fonts when you write are the hardest thing, and they can change everything. They really can. I’m always adjusting the lighting to make it just right. That’s a difficult question, because there’s so many great ones. My standard right now is Avenir. Just a simple on the computer. Just a simple one. I don’t know, but it shows a certain attitude. I’m very blunt. I’m Arial. I’m not an Arial person. It’s interesting. I’m not an Arial person, although I feel like Arial is the journalist font. Yeah, it’s the most neutral to me. It’s much more neutral than Verdana or Helvetica. Arial is the one that doesn’t interfere with my thoughts. It’s similar to me to music. I can never listen to music while I’m doing something else, because I get distracted. I focus on the music, so music is a thing. The same thing with font. If I choose a font like Avenir, then I cannot read the text anymore. It’s very particular, lights in the ceiling. It has to be done just right. Sometimes I’ll walk by an apartment and see that they’ll only have the lights on in the ceilings, and I think to myself, don’t you just want to have a little light somewhere, something to make it warmer? I never do light in the ceiling. Never. I always have light points falling down on your knees. You cannot read anything. I do everything wrong. When it comes to fonts and lights, disaster. Talking about fonts, I was so impressed by the notion of acquiring the at symbol. Thank you. I’m proud of it. I would have never thought of that as something that you would acquire for a museum. Can you talk about that a bit? I don’t remember how it happened. I don’t have eureka moments. I don’t remember anything, but I remember that I started thinking about it for the collection. Then I started researching it, and the more I researched it, the more I was thinking, “Oh my god. This stands for everything I believe in.” It stands for the old meeting the new. It stands for the timelessness of modern. It stands for idea of identity. It stands for bringing the shared economy into the museum. I cannot even acquire it because it’s public domain. I can only anoint it. One after the other, it just checked all the different boxes. It just made me really happy. I started thinking about it, and it took me a long time to acquire it, because some of my colleagues were very resistant. You probably have realized, there’s something really huge going on in the world, and because of that also in the world of design, when it comes to the junction of the digital and the physical world. The material and the immaterial world. There are so many people that still believe that RL, real life, is a juxtaposition, is other than real life. Instead, we know very well that their the same, one and the same, at this point. This rigidity of wanting to consider reality only what is not in the digital world carries also into the museum sometimes. It was really really hard to convince some of the internal people, it was not even the acquisitions committee of the fact that this acquisition could happen. When I brought it to the acquisitions committee, it was instead voted in. It was fabulous. I remember I was going to San Francisco. I was going to be at a conference in Berkeley, and I remember at that time I still had my Blackberry. It was several years ago. In the taxi to the airport, I had prepared about 23 emails that I was going to send to the press that I knew announcing the acquisition and I had a blog post already, so I was waiting for the blog to post on the MOMA blog, then I was going to hit send. I hit send basically 10 minutes before getting on the plane. There was no internet on the plane at that time. I landed in San Francisco. I had BBC interview requests. I’m like, “Oh my god.” It was really quite fantastic because it made so much sense, even though it might not seem that way. I think it’s just such a radical proposition. When I read that I thought, “Gosh, there’s so many levels.” I’d to better understand what yo mean by the old meeting the new, but A, to acquire something that’s not tangible. That’s a big deal. That we had done before. Acquiring something that’s not tangible was big, but not as big as the idea of acquiring something that cannot be acquired. Something that’s in the public domain. The idea of anointing instead of acquiring. In the past, having a museum meant having objects that were either unique or very rare, and caring for them, curating them. Curare means really taking care, and that was already put in trouble by the Industrial Revolution and the idea of design. You had surreal objects even before, but there was a sense of caring. When you have design, you break one, you put in another. In the case of the @, it was not even an idea of ownership. You didn’t even have to buy it. You couldn’t reserve the rights. When people call us here at MOMA, like they do for other objects in the collection, and they ask us for images to print in books, etc., we tell them it’s on your keyboard. Just push the button, and they’re like, “Excuse me?” We recommend to use American Typewriter because it’s the closest to similar font as the one that was used by Ray Tomlinson in 1972, but you could just push the button. It’s a completely different sense. In that way, as curators, we’re not anymore carer for objects, possessors, but rather, we are guides that prepare checklists of excellent case studies that can serve as paragons for people going about their business in their lives, so that they can feel what good design is. If an object cannot be had, cannot be possessed, because either it’s in the public domain, or it’s too big, like the 747, then we can do a virtual acquisition. Regarding the old and the new, the reason why I was saying that is because the first know instance of an @ goes back to the monks that were hand copying manuscripts. It was a way to abbreviate the Latin preposition ad, which meant in direction of or in relationship with. It had the same meaning in the Middle Ages. It was used to collapse, it that case it was only two letters. In the case of email, it was a bier line of code, but still it was synthesis of a preposition or a code that would put to terms in relationships. It’s the same, same, same thing. It’s really fascinating. It really is something I would have never known. Me neither. I don’t remember how it all started, but then I started … also, Ray Tomlinson just dies a few moths ago. He was the engineer that was at BBN, the company that had been contracted by the government of the United States to develop the internet, and he was in charge of the email program. He adopted this sign. It was on the keyboard because it has been used though the centuries as this accounting way to put relationship and ratios together. He saw it there and he was looking for a way to abbreviate the code that would connect the name of the person to the name of the computer to locate the person. He did some research, found out what it meant, and adopted it, and the first email he sent was about the use of the @. It’s really quite amazing how everything fit. It’s also incredible. Something we use everyday, the depth and history that comes with it that you just don’t know about. That’s why design moves me every single day, because the things that populate our lives, like little beings that are older than we are and that we couldn’t do without, really move me. They’re moving. They are amazing masterpieces. It sounds like the other reason it moves you is because people feel so connected to these things. They trigger such memories. They definitely do, but also, its the human labor, intellect, enthusiasm, passion that went into them. When you start looking inside objects and you use them like doors, there’s such passion, and there’s such history. That’s why design to me is so higher than any art. It really is a symbol of the love we have for other human begins. I love design very much. When did you start falling in love with it? Yeah. I grew up in Milan. Before falling into the design profession, I went through economics, did some journalism. I studied architecture, but I was lucky, because I fell exactly where I needed to fall. It was interesting to read bout that history and how you had volunteered for that, was it a festival? You were paid $15 a week. Yeah, it was the installation of an exhibition at La Triennale. I didn’t volunteer, I got hired. $15 a week. I’m so sorry. You volunteered to get hired, I meant to say. You must have done well enough that the editor of Domus said come on? Yeah, I kind of screamed at him one day. That’s way I think he hired me. You know the story? I read about it, yeah. That’s great. The spirit of an 18-19 year old. Yeah, exactly. Then he hired me, even in that case. Yeah, I think I was at $18 a week at that point. It was great. I was right. Of course, of course. It opened everything. Would you say he’s one of your mentors? Yeah, absolutely. When I think of mentors, I think of people that taught me also how to live, not only how to work. In the cast of Vittorio, he was fantastic and gave me my chance. The people that I think of my mentors are for, and unfortunately, only one is a woman, so I’ll start with her. Sarah Little Turnbull, she was, she just recently passed way She was like 98. She was a woman like this tall, and I’m making the gesture of getting to half my chest, and fierce. She used to be an editor of House Beautiful in New York City in the 1940s and 50s. At that time, she was dating Gordon Parks, so they would go to the Whitney, because that was the only place where an interracial couple could have lunch and not be looked at in a funny way. That’s what she told me. She was the mores glamorous. This tall, but she would have her suits made, her dresses made by Givenchy, custom made. She was just hilarious. We met in San Francisco because we liked each others hat at a gallery opening. At that time, she had her own lab at Stanford University business school. In the business school, all the doors would be brown, but hers would be red. Yeah, she was fantastic. She was doing anthropological research for design before people even knew that anthropology could be a boon for design. She was studying this and she was fantastic. My other big mentor was Giulio Castelli, who was the founder of Kartell, the plastic furniture manufacturing company. Amazing person who taught me of course how to work, but also how to deal everybody. How to learn form the craftspeople in the factory and the line of factory workers. How to make things. Also, he taught me how to have a marriage that lasts 70 years. It was just amazing the way he lived, the flair. Let’s just quickly talk about that. The marriage bit, and you were saying he taught you how to communicate with people that you’re working with. What’s the advice there? The secret of Italian design that I learned from him is that designers are great, but manufacturers are responsible for the greatness of an object almost as much as the designer. With Giulio, I did a book that was only on Italian furniture manufacturers. We went around and interviewed them all. The secret of Italian design was exactly that, the fact that the architects, designers spoke dialect and spoke on an even level with the factory workers and the craftspeople. There was clarity of importance. The architect was not more important than the cabinet maker. That’s the beauty. It was a transfer of knowledge and a collaboration that was really, really deep. We have a Tufty Too by Patricia Urquiola, and I was thinking about she designed it, but this has been hand made in Italy over four months, and these are the people that are really bringing this design to fruition. It’s a complete collaboration and these people are proud of what they do, and they would be offended if Patricia gave them too precise of a drawing. They have to sit there, Patricia has to do a sketch, and then it’s all about working together. That’s really the beauty of it, and that’s what so many countries are afraid of losing, especially Italy. How about the marriage bit? The marriage bit. I have a pretty … Touch wood, it’s already 20 years for mine. We’re not married, but we’ve been together for 20 years, so I consider it a marriage. I’m think I’m tackling Giulio pretty well. He has 50 years on me, but no biggie. It’ll get there. Amazing, it’s beautiful. It speaks to also having had a long life. Yes, he had a very long life. Actually, it was not 70, a little less than 70, because he died at 86, and they had been together since they were 18. Italo Lupi, who was the art director of Domus, then became the editor-in-chief of Abitare, and I went with him. Now, he’s still a graphic designer. He’s not really that active in publishing anymore, but even in that case, he taught me about work ethics. He taught me about relationships with people from all over the world and how to be really collegial with other people. It’s always more than just working. I think about being in New York, and life/work balance. Do you manage that? Yeah, I decided not to have children. Next life. You cannot have children in New York. I don’t know how they do it. I used to see these mothers with the child, the stroller, hailing cabs with their feet, and signing up kids for high school when they were in their crib. I just didn’t want to do it. My parents are in Milan, so I couldn’t have had them help, and I couldn’t even fathom the education system here. I was too terrified. Yeah, my sister, thank God, has two children. She lives in Florence. Florence. What a beautiful place to live. Milan is better, but Florence is pretty too. My parents are in Milan. I just came back. I was in both Florence and Milan, so I could see it. You mentioned some of your mentors and one of them being a woman, and before we were turning the mike on, we were talking about people I’ve interviewed in design, and all we hear is male names. What’s that about? There are many different reasons. I do a lot of public programs, and I have encountered what many people have said, that women tend to say no more often. Yeah, I can tell you. I do these programs almost once a month, and one time, I went through seven women artists before one said yes, and the nos were related to not being available or not feeling comfortable speaking in public. It really is that way, but then I remember I was did one public program. I do these R&D salons, and it was about conferences. It was called Conferences, Conferences, Conferences, and it was four females plus me. Five women speakers, but one of the speakers said there’s nobody that is African-American here, and that is bad. So, we started having this public conversation, it was fantastic. She completely convinced me that women might say no, there might not be enough black designers. Well, you know what, as a program organizer, it’s your job to go and find them no matter what. If they don’t feel comfortable speaking, you coach them. She made me realize that it’s very important. What is that? I think it’s your fault. It’s your fault, my dear. I see what you mean. It’s like journalists only highlighting the work of men. I don’t think you do that. I thing you’ve had your … At least one of the female designers you mentioned told you no, and I know that. She’s really curmudgeonly. What I do very simply, when people ask me for designers, I don’t even say anything. I give six suggestions, five are women. I don’t even say anything. You can notice or not. I just am trying to re-establish certain balance of diversity of all kinds. We’re also responsible for not having enough political diversity. For instance, I remember having a conversation with my colleagues, because we never have anybody conservative or from the right at MOMA. You know what? We should start inviting them, and have them speak, even though we might cringe inside. It’s important to have, especially today, when it’s so easy to fall in your own tribe, your own group, and just have on your iPad all of the news that only come from certain sources. It’s so important to diversify your landscape and your horizon. This might be not a great question, but do you think women bring something particular to design that men can’t? It was based on the cliches of the organicism, the flowers, etc. I’m not talking about that, but women are not the same as men, and the world has been a big men’s club for centuries. I’m sure that a predominance of women would change things. For the better or for the worse, I have a feeling for the better, but it would change. If for anything, just because it would be a departure. It’s interesting for you, as a woman, to be in such an important position in this field, one of the most important positions in the world. Yes, definitely, but, once again, if you look at the hierarchy of most museums, there are people that are female at my position, but very few females that are directors or that are really in the highest positions. That’s why we’re all so excited by the fact that Anne Pasternak became the director of the Brooklyn Museum and hired Nancy Spector to be the chief. It’s not as frequent and as normal as one would think. Let’s talk a little bit about the 3-D gun, a sentence that you had said that prior to that … Interesting divergence, from women to 3-D guns. Why not? You had said prior to that that you had seen design as benign. Blinders, yeah. I had blinders on. You hear me when I talk about design. I’m so gung ho and this kind of evangelical propaganda, that I force myself into this excessively positivistic view of design and I didn’t realize, I didn’t even think. That’s why it was such a big moment of revelation. I was like, “Oh my god. 3-D printing. You can do something mean with it?” All of the sudden, I started looking at things from a completely different viewpoint, and I started seeing how design can go bad. It can happen, or it can be designed that way. Many product designers face a dilemma of sorts when they work for big companies, but that’s one of the slightest moral dilemmas. There are much deeper ones that happen when you design objects that can be seen from both viewpoints. Ambiguity was the more important ingredient, and violence, which is the project that was inspired by this 3-D printed gun. It’s not about seeing the world black and white, evil or good, it’s what can be taken from both sides that’s really subtle and important. It sounds like there was an element of surprise there for you, that you had surprised yourself that design could actually not be benign. Yeah. It was so limited. That’s when I think I embraced ambiguity and ambivalence. Right now. I’m working on this theory of quantum design, because I’m really trying to work on this idea of ambivalence and how it’s reflected in how we design. Interesting. Let’s just talk bout surprise, though, for a moment. What exhibition of yours that you’ve put together really surprised you? The biggest surprise was Design and the Elastic Mind, which is an exhibition that I designed in 2008. The reason why it was a surprise is because I realized how a slight insecurity or vulnerability can be a boon for an exhibition, can be an advantage. People think of MOMA shows as canonical shows that reveal the truth to the world. This is how Matisse is. This is what Dada is. This is it. Instead, Design and Elastic Mind was an exhibition that was more about the what if. What if scientists and designers could work together without any filters or membranes between them. What if designers could help scientist hypothesize a future world, even if the experiment cannot be reproduced. Until two-three days before the exhibition opened, I really could not sleep at night. I was scared that it would be a complete flop, that it would erasable. Then, when it opened it was a big success also because I had left the question open, and in a way I have asked people what do you think. When you leave “…,” people feel more engaged, and that’s when I learned it’s always worth opening up the research from the beginning. Just a few weeks ago, two weeks ago, I organized a big program that launches an exhibition that will happen at the end of 2017, and I said openly, its an exhibition about fashion. The last time MOMA did a show about fashion was 72 years ago. I don’t know bout fashion. I know a lot about design. So you know what? I’m going to show you want a curator that is ignorant of fashion does when she has to put together an exhibition in a year and a half. I’m here naked. Let’s do this together. Its much more fun for me. It created generosity and a sense of participation, and in the end, the exhibition is something that people will already be familiar with. It’s almost like a single from a new LP release that is released before. People become familiar with the music. I think it’s a good way to go. Just about fashion, earlier when you were talking about the relationship between the designer and the maker, the manufacturer, I thought a lot about fashion, because fashion designers design these beautiful dresses, and then the seamstresses actually make them. They are the ones that, I don’t know if they’re unsung heroes. They’re possibly are quite sung, but it made me think about fashion at that time. Some of them are sung, others are destroyed by buildings that fall on their heads. That’s truly what the exhibition is about. The program that we did a few weeks ago, it was an abecedarium. We had 26 vignettes, seven minutes each, either narrated by a person or depended. R was for Rana Plaza, which is the building in Bangladesh which killed more than 2,000 people. I think it’s very important to be aware of what’s going on behind the objects. The labor issues, the manufacturing, the crafts, the technique, the skills. That’s pretty much the design knowledge that we can bring to the table. Fashion people talk about labor issues, but not as mush or as comfortably as they should, because they are in that field. Our coming form the outside allows us to tackle topics that are related to fashion that are not that comfortable. The acquiring of the @ and the Google Maps dot and the ways in which we interface with website. All these things that you can acquire now just changes the way that a design museum is viewed and seen. What do you think is the future for design museums and design acquisition? Paradoxically, people might not think about it, but it’s much harder to acquire digital artifacts than to acquire physical artifacts. Code is very fragile. I like to say it’s almost more fragile than porcelain. In the background of the museum, there will be so much work going on, just for the conservators and curators to figure out how to acquire code, and how to show and display code. On the front of the house, what people will see is an environment that is much more similar to the environment they really live in, which is an environment that is both physical and digital. This morning, I went to see a demo of a virtual reality tool that is being used by a designer that is part of an exhibition I did in the past, and virtual reality tools are becoming more and more comfortable. You brought up the word code a few times. I live in San Francisco and coders like to speak about themselves as sometimes even like their craftspeople. They’re designers. Is it a design? Are they designing? Yeah, definitely. I’ve been trying to understand as a complete ignoramus, what this holy grail that they have with the beauty of code is, because I haven’t gotten to it yet. There’s also a school here in New York called the School for Poetic Computation. Really coders consider themselves composers, poets. The idea of comparing it to poetry, I think, is the best. There’s beauty in synthesis. There’s beauty in dryness. Sometimes there’s beauty in flourishes. I think that the closest understanding of the concept that I’ve ever gotten to is a visualization by Ben Frye. Ben Frye is a wonderful visualization designer, and he visualized the code of Pac-Man. The code is written, but whenever there is images, he puts a different icon. Then, he has these beautiful loops because so much of coding is reverting to code already written. It shows you this incredible construction that happens mentally with code. I would like to understand it at a deeper level. Like everybody else, I have subscribed to Code Academy, and it’s like going to the gym. It’s worse than going to the gym, subscribe to Code academy, and then you don’t do it. I would like to learn a little bit of coding so I can understand it better. There’s a big history in that for you because you were the first person to do a website here at the MOMA. Yes, that’s right. You have done your homework, yes. I learned HTML. I was taught HTML by a PhD student that now is a great digital artist. She taught it to me. I used the budget that I had which was $300 to take taxis at night so she could teach me, and I coded the first website, which was so bad and rudimentary, but I did. It has the whole checklist of the first show from ’95. Amazing, 1995. That was very early days. Yes, it was, but it was necessary. It was very funny, because nobody at MOMA knew what a website was, and whether it was publications, communications, marketing, so I could fall through the cracks. In something I read, you said something like you don’t like using the word mavericks. Was it mavericks? Maybe, I don’t remember. I don’t have a particular allergy. I have other word allergies that are stranger than mavericks. What was I referring to, a particular context? Just designers. You said, “Maybe mavericks isn’t the best term to use, but these are the designers that are mavericks to me,” or something like that. Oh yeah, maybe because people want to cast creativity into these weird corners as if mavericks were weirdos, but in truth, there are many mavericks, just like there are many superheroes. Maybe I just wanted to normalize talent and design ingenuity. That’s why I was reacting to it. The reason I brought it up was because it sounds like you’ve just pushed so many boundaries, a true maverick. Maybe I just don’t like the word, the way it sounds. It’s like utterly. I hate utterly as a word. Utterly is really a word I can’t stand. What’s a word you love? Word that I love. Interesting. There’s a word in Italian that I love that does not exist in English. Meschino, which means a person that’s small and [inaudible], you understand. I guess I love that word. Designers are fantastic. When they’re not that good, they can do better, and design is an amazing discipline. The idea of expanding it just comes quite natural because the world has changed, and design is about constructing the world. The world now is also very digital, so, of course, you have to go there. I thought you were on sabbatical. I was until a few weeks ago. It was wonderful. I’m looking at your calendar and it doesn’t look like a sabbatical to me. Even during the sabbatical, it was never … The sabbatical was a staycation in the sense that I was not really traveling. I was working hard, but in a different way. I was teaching in the fall. I was a Harvard teaching. I was writing. I was doing studio visits. I just didn’t have that many meetings, and I didn’t have to come to Midtown. It’s so funny. The idea of having lunch downtown on a workday feels so illicit and wonderful, to this day. It’s the most exciting thing. I can have lunch in Chinatown, wow. It’s great. It’s the little things, never the big things. Okay, well thank you so much.